Ubuntu Tweak is a configuration tool that provides an easy to use, GUI interface for configuration of many important tasks in Ubuntu that otherwise need to be configured by editing some configuration files etc. Most importantly, it provides a centralized location for managing your system. However the recommended method of installation is by adding the PPA. The advantage is that you'll be getting automatic updates via Update Manager then. Once installed, Ubuntu Tweak will appear under Applications > System Tools sub-menu. Ubuntu Tweak provides configuration tools for managing Application related tasks, Startup Settings, Desktop and Personal settings and System Management tasks. Under Applications, you can install, remove, purge software, clean packages, install updates and even edit your sources.list. Under Startup Settings, you can configure Login and Session settings. Desktop tools contain the most commonly needed tools such as Compiz Configuration, Desktop Icon Management, GNOME settings, Window Manager Settings. You can change Computer Name, tweak Nautilus, manager Power and Security settings and file types etc under Personal and System tools. 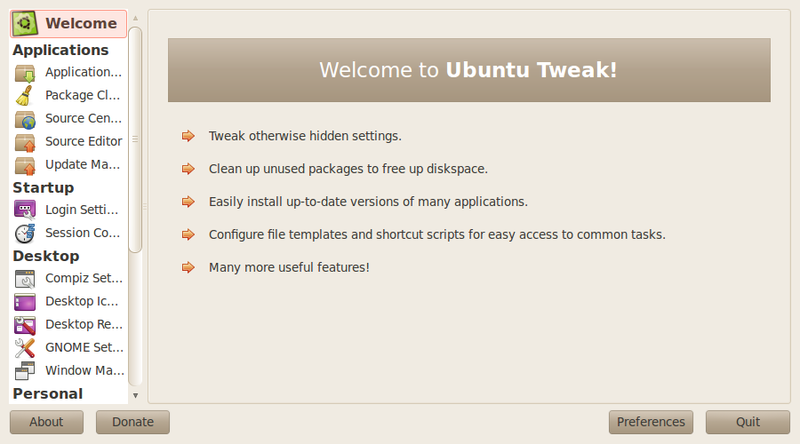 Ubuntu tweak makes it as easy as a click to remove your older Kernels. You can find it under Applications > Package Cleaner > Clean Kernels. Remember, it is recommended that you keep at least one older Kernel so you have got an option if your current one breaks due to any reason. You can change default applications for all the file types at one central location under System > File Type Manager.